Today was a bit of a non day in many respects. The whole group had to assemble. Seventeen of us, so a fairly complicated bunch to co-ordinate. Of the seventeen, twelve have brought their own bikes so the little courtyard is rapidly strewn with bike boxes and the contents being assembled into their owner’s pride and joy. There is some serious kit here and some serious riders as well. I suspect that we may have to resign ourselves to our traditional role of the tortoises to the undoubted hares in the group. Lunch had to be taken while the bikes and bags are loaded and shoehorned into the available space. A recommendation is to buy in some wine – some of the smaller places en route will be wine free zones. We do so enthusiastically. The area around the hotel is very smart indeed. Lovely homes, fine cars, the supermarket would put a UK equivalent to shame – such a contrast to the damaged and dirty city centre engulfed by water we saw yesterday. Many of the houses wouldn’t look out of place in an English suburb, red bricks, tiled roofs, garden and driveway. Around most street corners here, when you look up along the length of the street, just beyond the houses, steep, forested mountainous cliffs loom over the city. It’s a huge contrast between the hubbub of the streets and the splendour of these cliffs. I’ve always liked cities where you can see the world beyond but this is on a different scale. The plan is to escape the city, head for the suburbs and be ready to ride in the morning. Escaping from Bogota isn’t an easy feat. Every road seems packed, the pavements pretty much thronged and they just keep on unfolding – mile after mile. The traffic crawls along. If there is a highway code it is a very slim volume. We hit the Auto route Norte or rather we slowly merge into along with the rest of humanity. 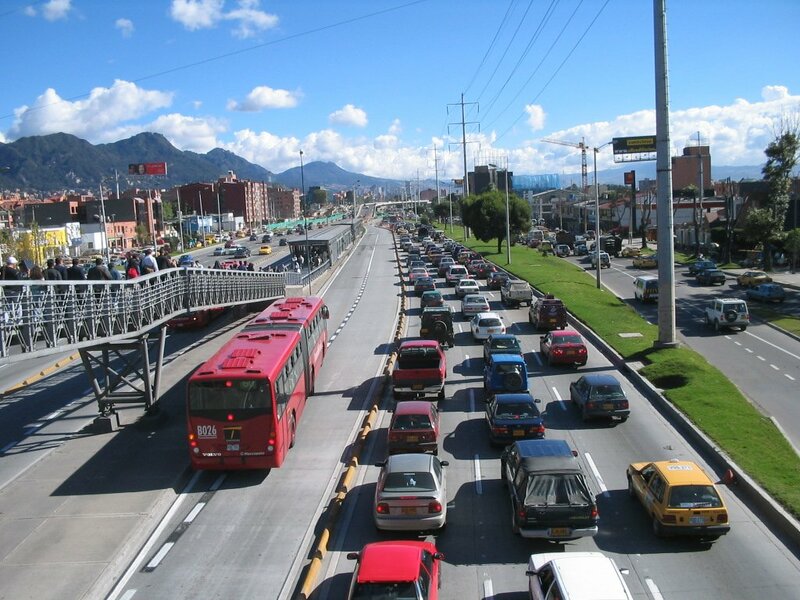 The road is flexible – four , five, six lanes and on the outside lane the Trans Milenio lane. This is Bigota’s rapid transit system, a seemingly endless stream of three flexing coaches, usually crammed and served by massive central platforms teeming with passengers. And we all inch our way out of town. It’s another example of how this city is running to keep up with its remarkable growth. There may be 9 million, or 10 or 11- no census seems to be able to keep up as the shanty towns get bigger and the ‘proper’ housing heads north along the plateau. At one point on the valley side there’s a sudden line in the sand – the brilliantly coloured houses just stop and the forest begins but the development looks so crammed and haphazard. Chia is our destination for the night. A suburb / building site which looks destined to be absorbed by Bogota in the blink of an eye but at least we’re outside the city limits for now.